RAPID CITY, SD – Each year, the Black Hills Stock Show awards individuals and businesses who have been instrumental in their support of the Central States Fair and stock show. 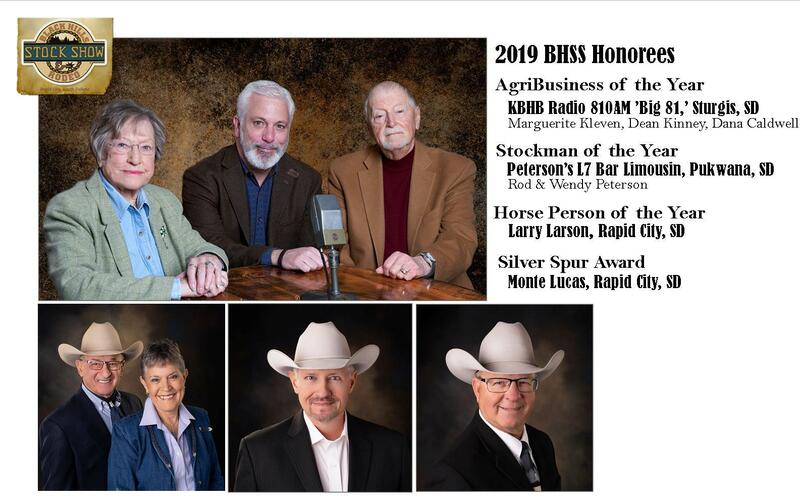 This year’s honorees include Monte Lucas, Rapid City, SD, Silver Spur; Rod and Wendy Peterson, L7 Bar Limousin Ranch, Pukwana, SD, Stockmen of the Year; KBHB Radio 810AM, Sturgis, SD, the Agri-Business of the Year; and Larry Larson, Rapid City, SD, Horse Person of the Year. A long-time ag and commercial lender in Rapid City, SD, Monte Lucas has been inducted into the Silver Spur Hall of Fame for his nearly 40 year involvement with the Central States Fair and the Black Hills Stock Show. He has served as a board of director, a co-chair of the livestock committee and as president of the board. For Lucas, the biggest draw of the stock show are the livestock shows and sales and anything that promotes youth. He and his business interests are long-time sponsors of the stock show’s Petting Zoo, World’s Smallest Rodeo and the annual Burger Bust. The Reliance, SD native grew up on the family ranch that included cattle, sheep and custom farming. As a 4-H’er from the age of 10 through high school, Lucas would go on to study business at South Dakota State University. Other community involvement includes serving as a director for the Rapid City Chamber of Commerce, as a director for Western Junior Livestock Show, and a director for South Dakota Ag Rural Leadership. The Peterson’s Limousin journey began because they were looking for cattle that would perform better on the rail. In 1970, when Rod and his father, Harold, were at John Deere Day, a clip about this “new breed of cattle from France” was shown during the movie. The clip talked about Limousin being muscular, feed efficient and very carcass oriented. When they got in the car to head home, Harold told Rod to find out everything he could about that breed of cattle because they had what was needed in their cattle operation. Today, Peterson’s registered, purebred herd stems from AI’ing fullblood Limousin bulls to their commercial cows, retaining all the females and breeding up over time. In the history of L7 Bar Limousin, only two females have ever been purchased and 100% of the present cowherd carries a family member’s herd prefix. Petersons began exhibiting at the Black Hills Stock Show when it was first held at the Central States Fairgrounds and have missed no more than a couple in the show’s existence. In all the years participating in BHSS the greatest memories are the relationships established and grown with commercial ranch operations, fellow seedstock breeders and the show’s attendees. The Peterson family has a successful track record at the BHSS over the years having exhibited numerous bull and female grand or reserve champions in the Limousin show and most notably have been honored to exhibit the Supreme Champion bull in 1997, 2001 and most recently in 2017. To this day, BHSS is a big part of L7 Bar Limousin’s ranch promotion. While success in the shows and sales is enjoyable and keeps the ranch’s name in front of the public, Petersons say Stock Show’s real value is being able to personally connect with so many of their customers in a small window of time. Rod will tell you that they were commercial people first and their four decades journey as a seedstock provider has been possible only because of support from commercial cattlemen and women. Petersons share that the reason BHSS has grown into the event it has become, is largely due to the leadership, staff and people behind the scenes focusing on the commercial livestock and ranch operations as the backbone of support for the event. The first 45 to spin on the Big 81 was the hit song, Alley Cat. That was on September 27, 1962 when Les Kleven and wife Marguerite took a call from the FCC in Washington, D.C. granting permission to begin service to the Sturgis, SD community. At 3:00pm on that day, microphones were opened with the first broadcast from a small building in downtown Sturgis. Just days after the station signed on, a three-man crew of Les Kleven, Dana Caldwell and Gene Walter were broadcastiing round-the-clock on the Cuban Missile Crisis. Whoever thinks radio is boring doesn’t know local radio. In the 57 years since, the local emphasis hasn’t changed, says owner, Dean Kinney. That kind of longevity in programming has earned KBHB 810AM a Heritage Station designation in the radio business. And recognition as Black Hills Stock Show Agri-Business of the Year. That commitment to public service is more than just lip service. KBHB is famous for its radio-thons, helping to raise millions of dollars over the years for everything from rural community centers to disaster relief funds and resources when the massive Atlas snow storm hit in the fall of 2013. In its 57 years on air, technology and delivery have changed immensely, says Kinney. “First and foremost, we strive to provide a product that is unique and largely unavailable through other sources or at least without going to multiple sources.” He continued, “Second, we make our product available where our consumers want to get it - on the radio, streaming, on our websites, social media platforms and mobile devices. KBHB has long been a part of the Central States Fair, of community 4-H and FFA events, the Western Junior Livestock Show, regional youth rodeo events and the Black Hills Stock Show. “It's a real honor to go out every day, promoting the business of production agriculture, the lifestyle of the ranch, and all of the wonderful people who live it,” says Kinney. Larry Larson grew up near Mobridge, SD in the big ranch country of North Central South Dakota. For many years, his parents owned a general store in the small town of Wakpala on the Standing Rock Indian Reservation but were later involved in farming and ranching. An enrolled member of the Cheyenne River Sioux Tribe, I continued my education in Mobridge where he and three brothers graduated from high school. After 11 years with the Oahe Vet Clinic in Onida, SD, he made the move to Rapid City in October of 1984. Along with beginning workm at the Black Hills Eye Institute where he just marked his 35th year, he gave riding lessons and produced a horse sale. He is also honored to be recognized by the Black Hills Stock Show as Horse Person of the Year. Larry Larson Photography, Inc, now in its 27th year, specializes in equine photography, graphic ad and website design along with equine photography clinics that have now drawn hundreds of students from across the United State and Canada.